No view could ever compare with the textures under my feet, the surrounding sounds, and the spiritual feeling I received from the Himalayan Giants around me. 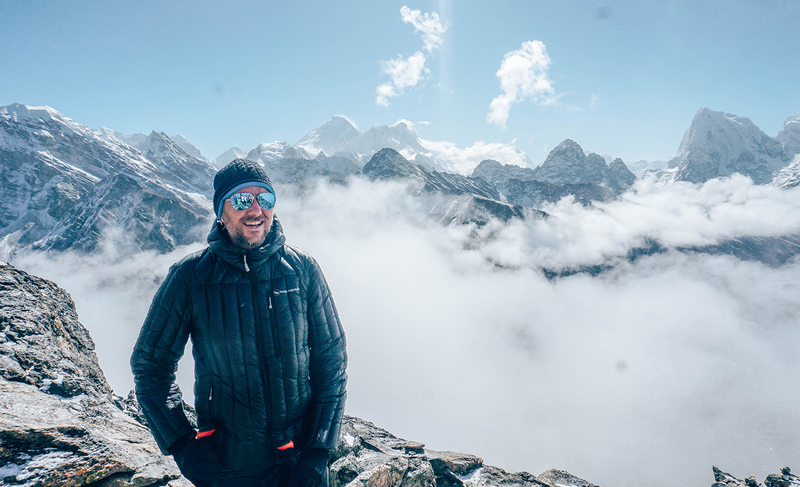 It has been a lifelong dream of mine to climb in the Himalayas, and I was not going to let my blindness be a barrier. 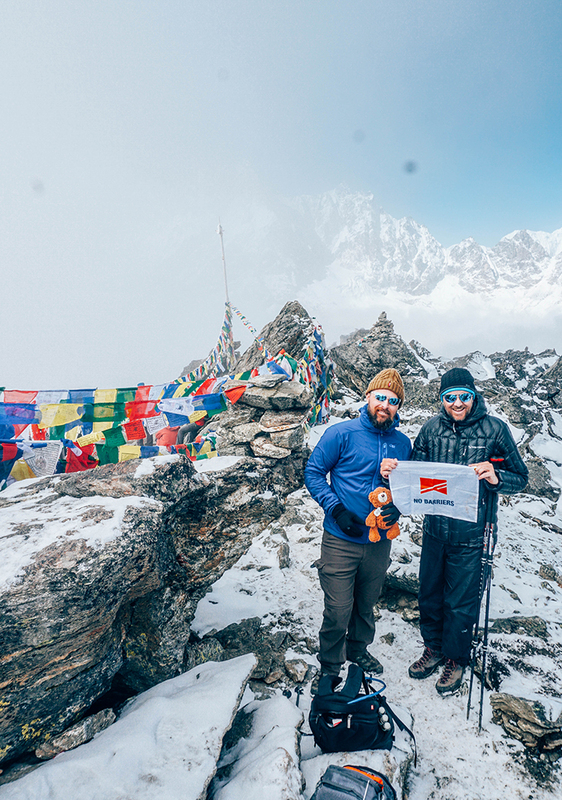 Armed with two trekking poles and a bell to follow, I was part of a team on an epic journey to slay 17,575 ft. Gokyo Ri. Even before our trek our mission was to give back; bringing laptops, water filters, wheel chairs, shoes, harmonicas, and much needed medical supplies to the Center for Disabled Children’s Assistance in Kathmandu. What a joy to interact with the kids and teach them a few songs on the harmonica! I couldn’t have done this trek without the help of my teammate Denny (a Marine Veteran) who primarily rang the bell and narrated the trail for me to follow. Two other teammates also helped with some bell jingling. After only about two hours of hiking I went off course a little and my leg slipped off one of the many crazy suspension bridges. Luckily, there was some makeshift chain-link or I would’ve fallen into a raging river. All patched up, I focused on being more diligent about the “hold-onto-the-backpack-in-front-of-me” method to keep me in line. Brushing off the events over a cup of ginger tea that night, our guide explained tomorrow would be our longest. This became a joke over the course of the trek as he stated this each evening. Once again in my element, I quickly learned that the Himalayas are intense and nothing like Colorado trekking. The trails are extremely rocky going pretty much straight up with minimal switchbacks. If you do switchback, it is 10 feet one way and 10 feet another with 18” to 24” step-ups a constant. Each morning Denny asked, “Ready, Motivator?” I replied “Yep” as we fell into a rhythm of dodging yaks, donkeys, and porters up into the heavens. On day five we were at around 15,000+ feet and it started to snow. Flakes hit my face, a smile grew, and I threw on my Shovelhead down jacket to enjoy this magical experience. All warm and toasty, I couldn’t be more excited to climb into my bag–ready to push for the summit. The next day we started our ascent at 4:30 a.m. from our base in a few inches of snow. One step at a time, one breath at a time, we chipped away the last 2,000+ feet through every false summit. Thinking I was dreaming, a faint voice in front said “Trevor, we’ve reached the top.” I belted out the biggest “Woohoo” anyone could muster at 17,575 ft. and thought to myself how stoked I was to be alive! 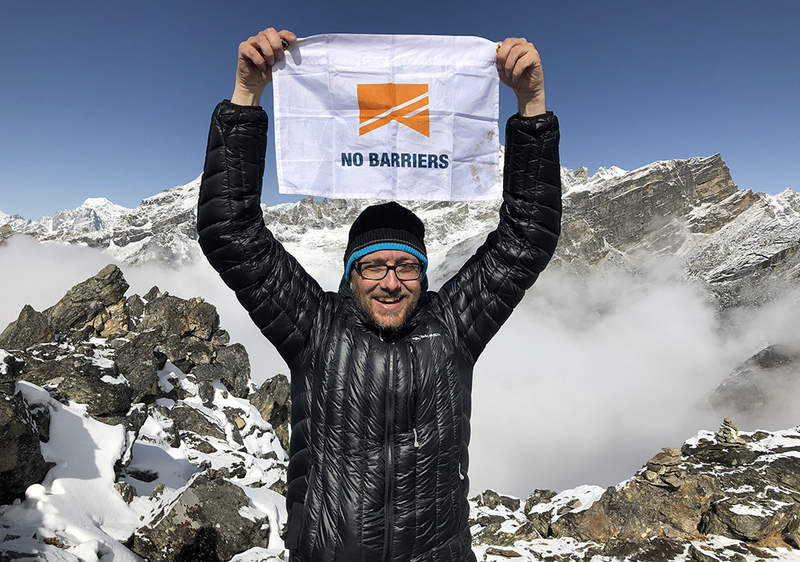 Beginning as strangers, leaving as friends, our team could see some of the 8,000 meter peaks of the world, including Everest. 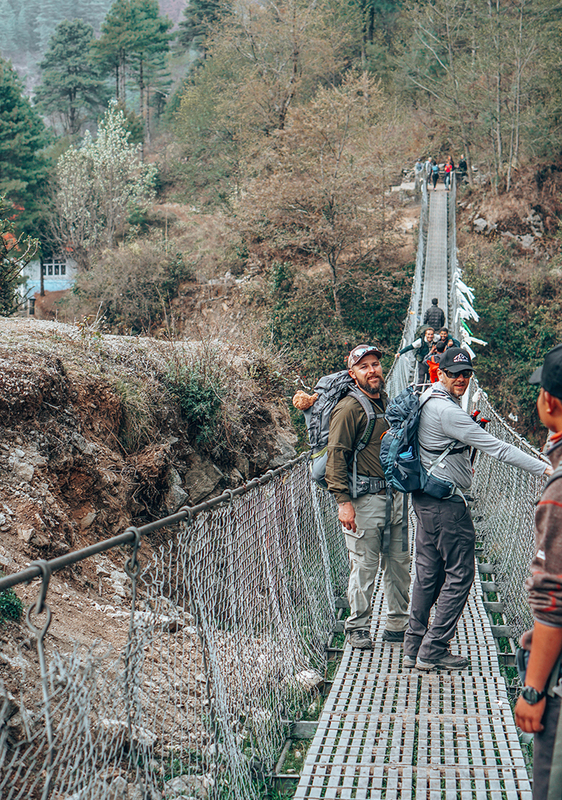 I never felt so proud to share the lack of breath with all of them, but no view could ever compare with the textures under my feet, the surrounding sounds, and the spiritual feeling I received from the Himalayan giants around me. –Trevor Hahn is a blind artist who makes sculptures out of random metal “junk”, nuts, and bolts. In his spare time he hikes the tallest mountains in the world. Trevor lives in Fort Collins, Colorado. Awesome Trevor! Rock On with your bad self! Completely inspiring and I can’t wait to read more about your adventures!